In 2016, director Jeff Wadlow and producer Jason Blum joined forces to create Blumhouse’s new horror film, Truth or Dare. Wadlow, together with his collaborators Chris Roach and Jillian Jacobs, designed a film inspired by It Follows and The Ring. The result — a thriller with action and humor, a horror movie with real stake, danger and fun all at the same time. The close-knit friend group was played by Lucy Hale, Tyler Posey, Violett Beane, Sophia Taylor Ali, Hayden Szeto and Nolan Gerard Funk. The center of the friend group, Olivia, played by Hale, cares more about everyone else than she does herself, choosing to build houses for the poor instead of going on the last spring break trip with her friends before they all part ways. Her friends, on the other hand, have no intention of going on the trip without her and convince her to go with them to Rosarito Beach in Mexico. A dangerous twist of events results in a terrifying, never-ending game of truth or dare. Upon their arrival back to school, the group of friends think nothing of the foolish game they had played on their last night in Mexico. However, when Olivia receives her first question of “truth or dare?” she begins to think she’s going crazy. As the game takes its turns on the rest of her friends, they begin to realize that this game is no hoax. The group of friends, which has now shrunken in size, learn about the origins of the game — innocent girls played it at school until one of them unleashed the demon named Callux. To end the game, the girl who started it had to say a chant seven times, then proceed to cut off her tongue and put it in a sealed jar. However, when Carter went to Mexico, he broke the jar and released Callux. In efforts to end the game once and for all, they take Carter back to Mexico to do the same thing. The six friends had now diminished to only three, and Olivia was faced with a decision. At the beginning of the truth or dare game, she was asked: “If you could choose to save your friends, but let the entire population of Mexico die — or save the entire population of Mexico, but your friends would have to die — what would you choose?” The innocent, service-loving Olivia at first chose to save the larger population, however towards the end of the game, she chose her best friend over the population of Mexico. This causes her to add millions of new players into the game. Truth or Dare emphasized the importance of friendship by portraying multidimensional characters for the audience to connect with. “What makes very human, real moments all the more heartbreaking is that the game is using them against our characters, and there’s very little they can do to stop it …other than play,” Wadlow said. Upon interviewing Hale and Posey in a video roundtable, they revealed their thoughts on the film. Hale particularly loved the close friendships that were portrayed and truly tested during the game. Posey enjoyed playing his role as the friend who maintains peace in the group while all the truths and dares are tearing them apart. Hale also touched on her role in Pretty Little Liars as Aria, and the similarities between her character in that series and her character Olivia in Truth or Dare. She believes that the two characters shared the same values in terms of friendships and the sacrifices that came with the obstacles that were thrown in their way. Both her and Posey then commented on the uniqueness of the film, especially in regards to the different appearance of the demon, Callux. Wadlow wanted a horror movie that didn’t embody the typical ghostly appearance or haunted eyes, but rather a distorted, evil smile. 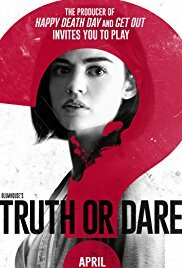 Truth or Dare did an incredible job of creating both fear and laughter while still keeping the audience intrigued. It pushed the characters to go as far as they could to stay alive, revealing their deepest secrets in the process.